When the weather is nice, Chicagoans flock to one of the 570 parks within the city. Soaking up the daylight and reveling in over 8,000 acres of community green spaces is easy when there are: 31 sandy beaches, three top-notch conservatories, 19 tree-lined boulevard systems, and lovely parks with views of the nation’s largest metropolitan harbor system. The Chicago Park District still exemplifies the motto chosen in 1837 when Chicago was incorporated: Urbs in Horto, which is Latin for “City in a Garden”. Here are some of our favorite parks in the city, popular among sightseers and locals alike, each highlighting different details unique to this vibrant city. Of course, we have to start off with the city’s largest and most visited park: Lincoln Park. Every year, a whopping 20 million folks frequent this green space, located along a beautiful 7-mile stretch of lakefront, making it the third most visited park in America — Central Park in New York City and the National Mall and Memorial Parks in Washington, D.C. are the first and second respectively. The best places to check out while here are the Chicago History Museum, the Peggy Notebaert Nature Museum (the butterfly garden is fantastic), and Lincoln Park Zoo — don’t miss the animal farm, the nature boardwalk and the tortoise shell-inspired South Pond Pavilion (the hot spot for yoga). Hike, stretch and bend, go for a run, pet some animals and rest in the grass — it's all here in Lincoln Park. 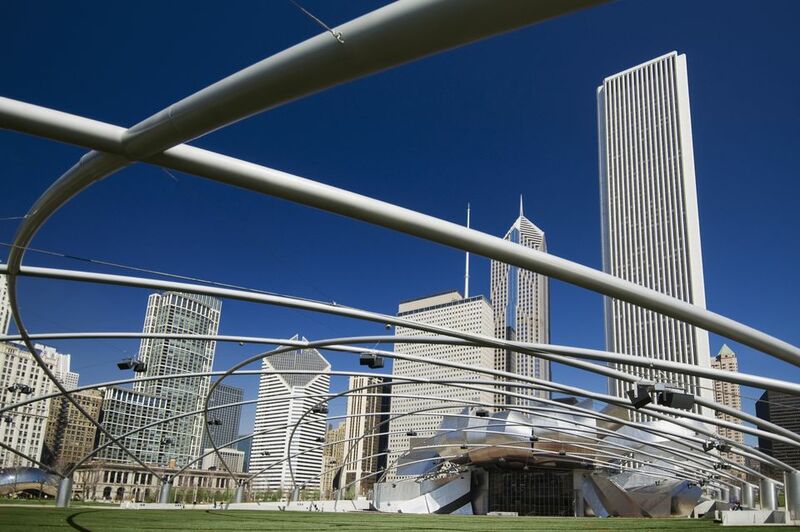 The Loop’s Grant Park, also lovingly known as “Chicago’s front yard,” stretches 319 acres along Lake Michigan in Chicago's central business district. Art Institute of Chicago; Millennium Park, where you can see the famous Cloud Gate sculpture, also known as “The Bean;” Maggie Daley Park, which includes a huge 20-acre children's playground, climbing wall, skating ribbon and formal garden; Buckingham Fountain, as seen on the television show "Married with Children;" and the Museum Campus, which includes Adler Planetarium, Shedd Aquarium, The Field Museum of Natural History, Soldier Field, and McCormick Place are all situated here. Notably, it’s also the location of Barack Obama’s celebratory victory speech from 2008 where thousands of supporters showed up in droves. Each summer, Grant Park is the setting for two of the biggest happenings in the city: Taste of Chicago and Lollapalooza music festival. Located in Humboldt Park, The 606 is one of the best places to spend an afternoon in the city. Much like New York City’s High Line, this is a place where you can bring your bikes, skates, or walking shoes and explore the elevated outdoor park. Built and designed on top of an abandoned stretch of railway track — the old Bloomingdale Line — in 2015, you can easily make your way through Logan Square, Humboldt Park, Wicker Park, and Bucktown neighborhoods while getting a little exercise. The 2.7-mile path is flanked by flowers, plants, trees, and art installations and there are several benches and places to rest along the way. Famous landscape architects, Frederick Law Olmsted and Calvert Vaux, designed Jackson Park in 1893 for the World’s Columbian Exposition World’s Fair. This south side park, located on 500 acres in Woodlawn, is the ideal place for playing outdoor sports: golf, baseball, basketball and tennis. Many Chicagoans come here to run or bike as well. Visit the Japanese garden or take a stroll along one of the bird-watching trails. Jackson Park will also be home to the forthcoming Obama Presidential Center and the Obama Presidential Library, a fully digital library. History abounds here at Chicago’s oldest west side public park, which expands 184 acres. This is the place to grab your picnic blanket and basket and cop-a-squat. Bridges, gardens, and lagoons are all here to explore should you decide to get up from your grassy spot. Active visitors will want to check out the baseball, tennis, and swimming. Don’t miss a visit to the Garfield Park Conservatory, the largest and best in the United States, with 120,000 plants covering 1.6 acres of garden space indoors and 12 acres outdoors. Douglas Park, located in the North Lawndale and Pilsen neighborhoods, has fields for football, soccer, baseball, and golf. There are tennis courts as well. This 161-acre park was created at the same time as Humboldt and Garfield parks and you’ll notice some similarities. And, if you like ear-bleeding loud music, come for the punk, metal, indie and rock music of Riot Fest, held here every year. The Chicago Bulls basketball organization collaborated with the Chicago Park District to create community learning labs for kids, creating an environment for children to explore not only the park grounds but also to develop a sense of community. West Loop’s Union Park, located on 13.46 acres in the Near West community area, is the site for two of the city’s biggest music festivals: Pitchfork and North Coast Music Festival. The park has several large fields, often used for various outdoor sports. The history of Union Park is also quite remarkable — it’s the site of several political protests and demonstrations since the early 1900s, most notably the Great American Boycott and the 2006 Immigration Reform protests. The Union Park Harvest Garden is an organic gardening program that teaches children not only how to grow and harvest vegetables but also how to cook and be healthy. Chicago Lawn is home to this huge 323-acre park, featuring two gymnasiums, an auditorium, four sports fields, a nine-hole golf course, fishing area, running paths, and a community garden. Don’t miss seeing the rose garden, prairie, and lagoon. A Dr. Martin Luther King, Jr. sculpture and an Art Deco Darius and Girenas Memorial are worth viewing as well. 500 recently planted trees make this park a true gem. Family-friendly programming is offered throughout the year. The list of great Chicago parks is long but we’d be remiss if we didn’t include: Washington Park, one of the cities biggest and best parks, which is also listed on the National Register of Historic Places; Chicago Botanic Garden in Glencoe; Ping Tom Memorial Park (originally a railroad yard) in Armour Square; the 55-acre Horner Park in Albany Park; Portage Park; Northerly Island, where many concerts are held in the summer; and Oz Park in Lincoln Park, a kid-friendly sculpture park featuring "The Wizard of Oz" creations.